Rick and his team did a fantastic job putting in a new hardwood floor in our kitchen and then refinishing the existing hardwood floors in the rest of our two-story house. His price was very reasonable and he did quality work and on schedule. Our house looks wonderful. He worked with us to schedule the work during our vacation and put us in contact with a mover who packed and moved everything out after we left for vacation and after Rick completed his work, returned everything to its proper place. We returned from vacation to beautifully refinished floors. We would highly recommend Rick and his team. Rick and his crew do amazing work with hardwood flooring! His work is truly artistic. I’ve seen a 50 year old and stained hardwood floor look brand new by the time he’s done with it. I highly recommend his craftsmanship. Rick and his crew did an incredible job repairing and refinishing our hardwood floors that had been damaged. The floors look great. Rick was excellent in keeping us informed on time schedule and budget. We initially met Rick at Northbay Hardwood Floors on the heels of a nightmare install/finishing scenario several years ago by a shaky contractor during the course of fairly involved remodel. Rick came in, listened to our concerns, clearly pointed out some sensible fix suggestions and gave us confidence he could not only repair the unacceptable work — but make it virtually unnoticeable — and then did so with good cheer and a high level of professionalism and craftsmanship. We have since called Rick back to help us restore and repair some existing hardwood floors in a different area and our experience was equally positive. Rick genuinely cares about the quality of his work and makes certain everything he does meets your expectations. And for that, my wife and I are very appreciative and would recommend to a friend and/or call NorthBay Hardwood Floors again without hesitation. We used Northbay Hardwood Floors twice. They refinished the floors in our San Francisco home and installed new flooring in our Sonoma home. The craftsmanship was excellent. The finishes were what we requested. The woodworking was excellent. The work was completed on time and within budget. Rick works hard to give the customer what he wants. Rick and his team refinished my 60-year old oak floors and made them so so beautiful again! They looked so beautiful I didn’t want to put any furniture back in the house. Rick helps you understand your options, whether is is the stain color, or whether to repair a section. In addition to knowing his trade, and having all the right tools, he is easy to work with. He communicates well, shows up when he says he will, gives experienced advice, and gives a ‘no surprises’ estimate. I totally recommend Northbay Hardwood Floors. And by the way – he is the go-to hardwood floor guy in our neighborhood in San Rafael. 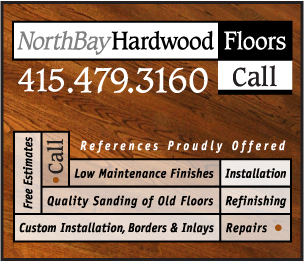 Call 415-479-3160 and speak with Rick to schedule your complimentary flooring estimate. With his expertise he can answer your questions and any concerns you may have. Thank you for considering us and your continued business. Grateful for your kind comments, thank you.